We’d love your help. Let us know what’s wrong with this preview of The Year's Best Science Fiction & Fantasy Novellas 2015 by Paula Guran. To ask other readers questions about The Year's Best Science Fiction & Fantasy Novellas 2015, please sign up. I was really glad to see this book appear on SF Signal. It's great that there are soooo many year's best science fiction and fantasy short story books, but they only include one or two longer stories, if any. And I haven't had time to get to stories in the online magazines this year the way I like I like to. And a lot of magazines, even online, aren't even publishing novellas anymore. They want the eyes and people don't have time to read, even when pixels don't cost anything. I hope that if they I was really glad to see this book appear on SF Signal. It's great that there are soooo many year's best science fiction and fantasy short story books, but they only include one or two longer stories, if any. And I haven't had time to get to stories in the online magazines this year the way I like I like to. And a lot of magazines, even online, aren't even publishing novellas anymore. They want the eyes and people don't have time to read, even when pixels don't cost anything. I hope that if they think they could get additional revenue from reprinting in books like this maybe there's a better chance of getting more stories published. There was a pretty big time delay for this one though. It came out in August and most of the stories are from 2014, some of which I already read quite a long time ago. Not that they go out of style, but when they're trying to compete with a lot of anthologies, which they definitely are (I have at least ten on my kindle already now, and five on my library bookshelf, not to mention my anthology to-read Goodreads shelf) being fresh is important. It puts pressure on me to hurry up and read your book fast before the next round of awards get announced, stories are available online or books get published. Which means they need to get the book out fast. Especially when some of the stories overlap other publications, there's less incentive to buy a book with several stories that I've already read. Maybe the turnaround will be faster for the second edition. I very much hope there will be one. Though it would be great if there were separate editions for fantasy and sci-fi perhaps, so we could have more stories. Nancy Kress - Yesterday's Kin - I read this in Gardner Dozois' The Year's Best Science Fiction: Thirty-Second Annual Collection and loved it. Here's the beginning of my review from then and a link to my full review as well: This was nominated for and won tons of awards. I'm not usually on the same page with award committees with all of their choices, though I've certainly found some great stories by using them as reading lists every year. But this story was immediately interesting and engaging. I was drawn to the characters and the mystery. And the mix of hard science and family dynamics and social dynamics was really appealing as well. Full review. Patrick Rothfuss - The Lightening Tree - This is a really old story. I read it in Rogues reprint anthology in June 2014, which means it came out long before that. I don't know what criteria Guran used to pick these, I'm sure she had good logic, but despite him being a big name author and this series being really popular, choosing stories that have been out for a long time and have been published several times doesn't seem like a winning bet to me. Anyway, I liked the story well enough when I read it even though I wasn't familiar with the series yet. He's a good writer. Genevieve Valentine - Dream Houses - It's driving me a little crazy trying to remember where I read another story with a similar plot, at least the part about a man woken up too soon on a spaceship and being desperate for food, with similar results. This one had a lot more going on though. Too bad the conclusion sucked. That happens way too often with short stories, they're interesting and gripping and then the end is a total let down. But at least the story renewed my quest to find great choral music after I didn't have any luck the last time I tried after Non Nobis, Domine from Henry V inspired me again. There was too much at the library to know where to start and what I tried was all wrong. I'm hoping using the word motet helps this time. The story reminded me of Yesterday's Kin in its structure, the way it wove back and forth between the different story points, even though the focus was still very strong. It's something that works very well in a novella but a short story has to focus on just one idea much more. Like this was about her and her brother in recent history, her and her brother and whatever happened in the past, her on the ship dealing with Capella not telling her the truth or helping her, her thinking about music and that aspect of the past, different ways those things have overlapped. I guess it was like a motet, now that I think of it, everything weaving in and out and layering and building. I wonder if I was able to separate the different ideas out and add them up how many "voices" there would be, if Valentine took it as far as to run it parallel to the song in the story with it's forty voices. But then I was so very frustrated when I finished this story. I put in over a hundred pages into it and then the end was just dumb. Big spoiler, don't read if you want to read the story (view spoiler)[I suspected the ship was playing games with her, but we don't know why. And what the heck the "shadow" was doing there made no sense, is not emotionally fulfilling, doesn't resolve any of the storylines. It would be a nice neat package if it meant anything. Why would her brother have tortured her for that long? He wasn't trapped on the hold side of the door like she was on the ship side because she kept getting glances of him walking around the ship. So he let her starve nearly to death for nothing? He scared her for nothing? Because he sure as hell knew she could keep a secret because of their childhood secret. It just sucked. Sucked. (hide spoiler)] Sometimes I can shrug and say that a rotten ended didn't entirely ruin a story, but I'm not sure how I feel about this one. It was so interesting and complex but then to feel like it was all a waste is really disappointing. Mary Rickert - The Mothers of Voorhisville - The Witches of Eastwick times how many? Did the guy in Eastwick drive a hearse too? Maybe that was the point, maybe it was supposed to be the same guy, I don't know, but it felt cheesy. It succeeded in making it clear to the reader what was going on, though the women didn't understand for a long time, if they ever admitted it. There was enough going on in the story that it kept me reading but it didn't do anything special for me. Yep, mothers love their kids and will do anything for them, even if they know they probably shouldn't. That's not news. There were other stories that should have been in the book over this one. Just from the list Guran provided in the Introduction, Rachel Swirsky's Grand Jeté was fabulous, one of the best of the year by far. Ken Liu's The Regular was also great. Of course both were in Dozois' The Year's Best Science Fiction: Thirty-Second Annual Collection as well. But this story was just eh. John P. Murphy - Claudius Rex - This reminded me a lot of the fun story by Jérôme Cigut in Dozois' The Year's Best Science Fiction: Thirty-Second Annual Collection called The Rider, also about an AI and human partnership, check it out if you get a chance. I'm hoping Cigut will write more stories about those two. And it was already mentioned that Ken Liu's The Regular was very good, with a similar theme. This mystery was very enjoyable. It was a nice change of pace from all of the grim and depressing stories that are usually in these anthologies. And it still had important themes, it wasn't just fluff. That's the best kind of fantasy and sci-fi to me, make it fun and thoughtful. It felt like the first in a series, it would be great if it was. Seth Chambers - In Her Eyes - This was A Spell for Chameleon meets iZombie, Vol. 1: Dead to the World with Song's physical and personality changes. It was good. It had that sort of typical award-winning short story feeling, though it wasn't grim, it was clearly going no place good. It had interesting issues about identity, attractiveness, freedom, love, family. And as R.A. Danger said in their review, "Sometimes changes means taking the bad along with the good." I really liked that, it brought it into focus for me. James S.A. Corey - The Churn - I listened to the audiobook a few months ago because that what my library had for some reason, they didn't have it in print. All of the short stories from The Expanse series, which this story is a part of, are good for fans. They fill in background about the characters, but also come at the world the authors established from different directions and fill it in as well, making it richer and more complex and more real on every level. This book did that for Amos, one of my and probably many people's favorite characters. He's always been kind of mysterious, so seeing this side of his history was illuminating, just as the stories about other characters have been. It's hard for me to judge at all whether people who are unfamiliar with this series would find this to be a good story. It's only peripherally related to the series in a way. It's history, the history of one character and he actually only plays a small role in the story, though the story has a major effect on his life. I think most people would find the future Baltimore the authors have imagined to be interesting (if a big grim, I know) and the story to be a success. Certainly fans would find the ending illuminating. K.J. Parker - The Things We Do for Love - Apparently it's a badly kept secret that he's Tom Holt, but I didn't know. I've seen the name but I don't know if I've read other Parker stories. I've enjoyed a couple Holt book. This story about a thief who hooks up with a witch and then can't escape from her attentions wasn't particularly memorable. It sounds a lot more exciting than it was. It was fine. In a dry, Old Greek philosophical kind of way. Prime Books inaugurates a new annual series with this excellent anthology that focuses on mid-length fiction--novellas. The new series stands as an offshoot to their established and successful series The Year's Best Science Fiction & Fantasy edited by Rich Horton that features mostly short stories. This collection is impressive in both consistency of quality and diversity of range. Due to the longer lengths, only 9 novellas made the anthology, but even the honorable mentions that didn't mak Prime Books inaugurates a new annual series with this excellent anthology that focuses on mid-length fiction--novellas. 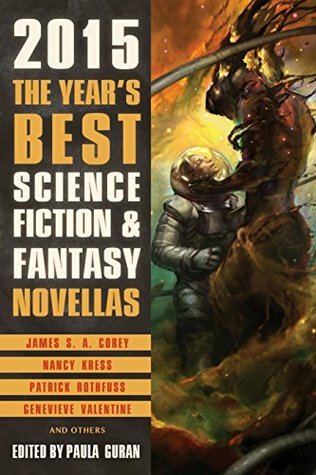 The new series stands as an offshoot to their established and successful series The Year's Best Science Fiction & Fantasy edited by Rich Horton that features mostly short stories. This collection is impressive in both consistency of quality and diversity of range. Due to the longer lengths, only 9 novellas made the anthology, but even the honorable mentions that didn't make this volume are excellent and worth hunting down: "Grand Jete (The Great Leap)" by Rachel Swirsky was included in the afore-mentioned Horton edited anthology of mostly shorts, John Langan's "Children of the Fang" and Lavie Tidhar's "Kur-A-Len" were both in The Year's Best Dark Fantasy and Horror: 2015 , ed. Paula Guran [Prime Books]. Seth Chambers' In Her Eyes [5 stars] is a crass-yet-smart supernatural urban fantasy in which a museum curator has a relationship with a shape-shifter. Patrick Rothfuss' The Lightning Tree [5 stars] is a clever and moving romp with one of the secondary characters from his The Kingkiller Chronicle fantasy series. This spot could have just as easily gone to another novella based on a character from this series that also came out last year, the poetic The Slow Regard of Silent Things . John P. Murphy's Claudius Rex [5 stars] is a speculative fiction detective story in which a PI and his AI team up to best the bad guys. James S. A. Corey's The Churn [5 stars] is a dystopian sci-fi prequel to the Expanse series. While the heart of the series is off-Earth expansionist, this novella focuses on a character born without privilege on a wasted Earth. I've been greatly interested in Novellas for quiet a while. Both as a reader and a writer the appeal of doorstopper books has been greatly waning in my appreciation. In short, I was eager to get my paws on it, and glad that I did. I love the cover ( for me that can be a deal breaker ) I picked up on new authors, Patrick Rothfuss being the primary that I will pursue. As a collection with no theme but size of story it's all over the map. Inevitable I guess. I graded stories from 0-5 and had one 5/ I've been greatly interested in Novellas for quiet a while. Both as a reader and a writer the appeal of doorstopper books has been greatly waning in my appreciation. In short, I was eager to get my paws on it, and glad that I did. I love the cover ( for me that can be a deal breaker ) I picked up on new authors, Patrick Rothfuss being the primary that I will pursue. As a collection with no theme but size of story it's all over the map. Inevitable I guess. I graded stories from 0-5 and had one 5/5,one 4/5,one 3/5, four 0/5 and 2 skipped. That has more to do with my lack of interest in the subject matter. The only that really annoyed story was The Things We Do for Love by KJ Parker. It reads like a 1930’s or 40’s caper that was quiet charming until it got so clever that I had get out wikipedia out to figure out what the references were, such as AUC 667. The story is set in an alternate world with plausible sounding places that I don’t know. The tip off for me was ’Thuria’ a moon of Barsoom ( Burrough’s Mars ) and a town in Greece. I learned that the stories take place in a mundane alternate universe to no purpose that I can discern. I did read that Parker is Tom Holt and he has been writing historical novels which explains, but doesn’t excuse it. Oddly enough I caught a few typos. Page 440 has‘fefore’ , 446 has a weird line jump where a sentence is split in half. I caught a couple other typos earlier but didn’t note them down. Overall I applaud the effort. Perhaps one for Science Fiction and one for Fantasy would be a better way to go in the future. I will continue with my novella reading, I really do enjoy the smaller scale combined with depth. The first novella, Yesterday's Kin, was excellent and ended well. Looking forward to the rest! Aliens come to Earth saying that they want to help find a cure for a virus that's coming to Earth. The story switches between Marianne a scientist who looks for new haplogroup of mitochondrial DNA and Noah a young man that's addicted to sugarcane and doesn't feel like he fits in or that he can live up to his siblings. When the aliens come in, it causes a bit of chaos among the humans. One thing interesting was how the alien culture was described and their language. Bast can answer any question or help with any problem, for a price that is. The kids of the village think highly of Bast and know he'll keep their secrets as well. He has the kids go on a quest, like getting certain flowers or giving information to him. This one feels like I landed in the middle and it never felt like it ended. Nothing like floating in space for 5 years with 6 months' supply for the crew and a computer A.I. to talk to. Amadis spends her time with reading, watching movies, hearing songs, talking to Capella and reliving her memories. The memories are mostly from Earth, more than the time spent among the crew. Memories of her life, how she got the job on the ship and knowing her brother didn't approve of it. All this helps past the time as she divides her food up for the long years ahead. Does she make it? Only the rabbit knows. When a stranger comes to town, the women get some angels or maybe their monsters. The Mothers write their accounts down the way they see their story. Each writer (Elli, Tamara, Maddy, and Pete) has their own version on how certain event's came to be. One thing they all agreed on was that they now had children with wings. With their secret out everything starts going out of control for the Mothers and the children. Emotions run away and maybe sanity as well. A mystery with murder, an item stolen, and one detective that gets an A.I. for a boss. The A.I. Rex wants Andy to help him solve who took out Grasso and who tried to delete him as well. It may have some different future science, but please Andy figure out before I do, what the stolen is. The story has an easy way to tell when Andy and Rex are speaking to each other. Song a polymorph and Alex spend time enjoying each of her forms until a bomb goes off. Sometimes changes means taking the bad along with the good. The underworld's about to be hit hard. Now if Timmy and Erich can survivor both worlds. More than just avoiding police and obeying orders from the boss. Timmy and Erich's past friendship will be coming into play. In the end it's all up to Timmy. A thief and an immortal witch goes around robbing everyone. Until the day the thief wants her to get out of his life. Robbing a place is easy when you got a witch to help you. The witch tells him that the one that gave her the power say that bad things come out of good and Vic verse. The story later examines if what they did manage to do the opposite effect or not. The other was him trying to get her out of his life instead of continuing to stick to him like a magnetic. So how does one get an immortal to leave you alone? The day goes well for father and son until a train tries to kill them. That someday the father is killed by a train. Rupert the son is convince that some trains go off their tracks. The mother is convince she must stop his imagination and all this talk of trains turning into beast. Just when the mother thinks she has succeed into erasing rail rails and trains from his life. The accident occurs and her son's life rewinds back to the time of trains. Therefore it starts and new chapter for mom and son. What will she do this time? Several of these stories were captivating and very good. A few I've already kind of forgotten. Well worth wading through. I hope the idea of Novella collections starts becoming more popular. I only read the novellas by authors I already follow. Stories that fill in the gaps in bigger series. And what I read was fine. I'm just not big on novellas. Not enough to chew on, usually. But if you like good scifi novellas, 40-60 pages, these are fine. A couple of maybe not-quite-the-best novellas, but the rest are pretty damn good. Standouts for me were the Bast story by Patrick Rothfuss, and Claudius Rex by John Murphy (I think, writing this review from memory and I’m too lazy to dig out the book again). I got this book because the Churn is in it, but found great novellas by others. I’ve always liked the novella length, and I know I’m not the only one, but it’s been a while since they were considered commercially viable, though plenty of “short” novels published in the 50s and 60s were actually novellas. This collection pulls nine, including some nominated for Nebula and World Fantasy Awards last year. The balance comes close to the middle with five stories I really like and four I really didn’t. This surprised me a little as I’d normally expect more of a cross section of th I’ve always liked the novella length, and I know I’m not the only one, but it’s been a while since they were considered commercially viable, though plenty of “short” novels published in the 50s and 60s were actually novellas. This collection pulls nine, including some nominated for Nebula and World Fantasy Awards last year. The balance comes close to the middle with five stories I really like and four I really didn’t. This surprised me a little as I’d normally expect more of a cross section of things that worked for me to different degrees, but every collection is different. -> Yesterday’s Kin by Nancy Kress, which I actually read in the 32nd Annual collection by Gardner Dozois, but is a good story regardless. -> The Lightning Tree by Patrick Rothfuss, which makes me want to pick up the first of the Kingkiller Chronicles. -> Claudius Rex by John P. Murphy, which was a nice blend of science fiction and noir, with an AI I’d like to classify as benevolent. -> In Her Eyes by Seth Chambers, which I didn’t expect to like when I started, but the main character’s love interest proved both to be a shapeshifter and really complicated. -> The Churn by James S.A. Corey, which gave me some great background on a character I really liked in the first season of The Expanse TV series, and I’m slowly making my way towards the novels. As for the stories that didn’t work for me, I’ll just leave it here that they didn’t. your mileage may vary. Of course I told myself I would pick and choose from the table of contents, since not everything would appeal to me. In the process of reading I looked through a little of them all, however. a bit of Claudius Rex by John P. Murphy (but I didn't like it - even though I had told myself t Of course I told myself I would pick and choose from the table of contents, since not everything would appeal to me. I do not remember exactly what happened in them all, except that it was pleasing to me in the end. When I was little I would go through these short story collections all the time. In fact, science fiction/fantasy was my genre of choice (perhaps since it may have been my father's? I'm not sure - I think my copy of Carl Sagan's text is his for example). I received a copy from the first reads program here on goodreads.com and this is my honest review, as usual. I really enjoyed this collection! There are many novellas included. Good Science Fiction and Fantasy, with a few Sci/Fantasy thrown in. None of them felt out of place. I enjoyed every story included, some more than others. But none I had to trudge through. It's hard to pick a favorite, but if pressed, I would say Where The Trains Turn. I couldn't that one down. So good! I do think there is I received a copy from the first reads program here on goodreads.com and this is my honest review, as usual. I've been reading a lot of short stories as of late (Gurin's collections) and this fell short of those unfortunately. In particular there are a couple of tales in here that felt like they would have been better served with some tighter editing to shorten them up. None of them struck me in the "I wish this had been a whole novel" so in those cases mission accomplished. So I bought this because it had a Patrick Rothfuss novella that I had to read, but was pleasantly surprised by the richness and variety of the other contributions, ranging from comic to deeply disturbing. Lots of writers I had never heard of, who I will now have to go look up to see what else they have written. I recieved this book in a Goodreads Giveaway. This book was really great. I love novellas and science fiction and this was the perfect combination of both. I have since passed this book onto my family to read. Compilations are always hit and miss, but this one had only a few misses, and some stories were surprisingly good. Worth reading.